Looking for a good place to stop on your cycle ride for some rest and refreshment? If so, take a look at the list of refreshment stops that the tourers use on their rides. It’s recently been revised to include only those which we consider local in touring terms so they’re all in Sussex plus a few on the western side of Kent. Those further away such as in the Seine-Maritime department of France have been deleted but will appear in a future list which may prove useful to cyclists staying in Dieppe. Luna Rossa Italian Restaurant, Newhaven for morning coffee. The Refreshment List is a Google Map showing the location of each of the thirty places. It was off to the Lavender Line at Isfield for the tourers on Sunday, a round trip of 43 miles, to visit one of our favourite refreshment stops, Cinders. It’s the station buffet which is run by volunteers and, as you walk in, you feel as if you’re going back in time to the days of steam. There are plenty of old railway signs and pictures adorning the walls which add to the interest. After getting our drinks we decided to sit outside on the platform and admire the trains; there was certainly plenty happening! The ride to and from Isfield took us along some very pleasant country lanes passing through Laughton and Palehouse Common on the outward trip, coming back via Glynde on the return trip. 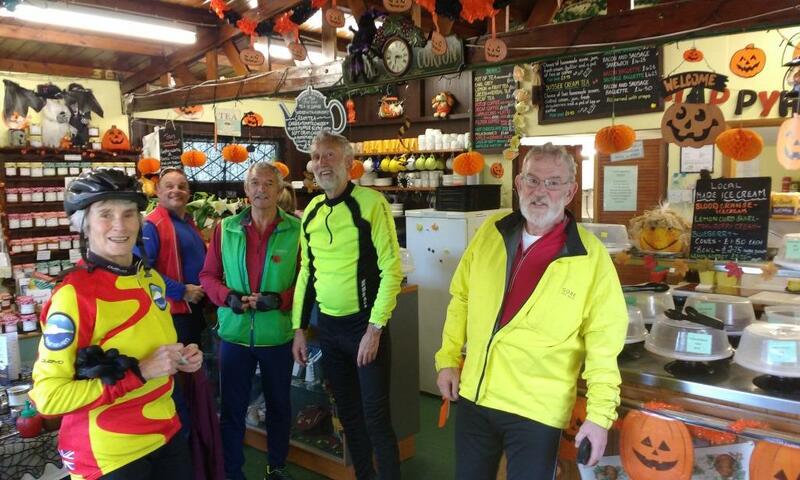 At this time of year of course, the leaves of the hedgerows and trees are changing colour so we’ll soon be doing some Autumn Colours rides, similar to last year. As usual, details will be on the Rides Calendar. The Refreshment Stops map has recently been updated with a couple more café stops in Sussex and seven in Seine-Maritime. I’ve decided to start adding some in France as I know that some Cycle Seahaven cyclists hop across the Channel to Dieppe for a bit of cycling in the Seine-Maritime départment and, of course, some continue to Paris. This map may be of use to anyone who is planning a ride and looking for somewhere to stop for a rest and some nourishment. All the stops on this map, mostly cafes, I’ve found to be cyclist friendly. Some are better than others but I’m not going to grade them, suffice to say that they’re of an acceptable standard. However, I will start adding a bit more detail to the descriptions which may prove useful, especially if there’s something unique about the place. For example the café we visited today on our Sunday ride is a gem of a place. It’s the Castle Cottage Tearoom by the castle in Pevensey. As you enter the café you feel you’re going back in time to the 1930/40s; the background music reinforces that feeling. The service is very good as well and there’s a lovely garden to sit in; well worth a visit. There are now 37 refreshment stops on the map. More will be added whenever we find a café, tea garden or bar that we like and is cyclist friendly. 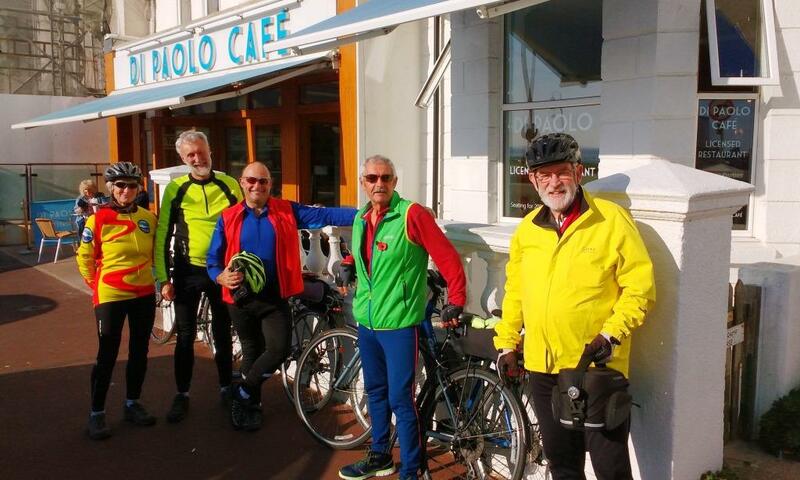 None are shown in Seaford as they are too close to cycle to on a touring ride. Over the past week there have been five touring rides and anyone cycling in all of them would have clocked-up 250 miles. It provided a good opportunity for cyclists to get some decent mileage in their legs, especially for those going on long distance cycle tours soon. It started with a ride to Heathfield on Sunday which always proves mildly challenging as there’s a fair bit of climbing involved to get there. However, as usual, the return trip via Lions Green, Muddles Green and Chalvington was very pleasant as it’s mostly downhill or flat and goes along some very picturesque country lanes. That was 42 miles completed. The following two days (Monday and Tuesday) were birthday rides for Joe and John. Each ride was 70 miles so no prizes for guessing how many years they were celebrating! The rides involved cycling a few laps of a route based on a ‘figure of eight’ circuit starting at Arlington Reservoir and passing through Ripe, Golden Cross, Chiddingly, Laughton, Chalvington, Arlington and Upper Dicker. 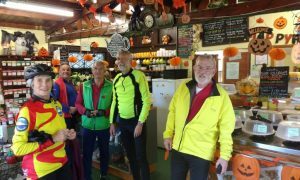 There were many refreshment stops at some of our favourite cafes such as the Ripe Village Stores, the Village Shop Café at Upper Dicker, Chiddingly Village Café at Muddles Green and the Arlington Tea Garden. 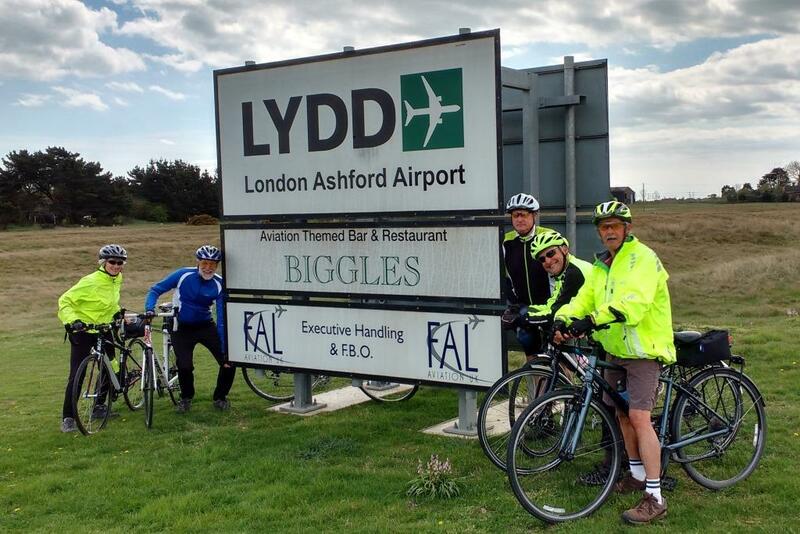 Wednesday was a rest day but on Thursday six of us loaded our bikes into the backs of our cars and drove to Rye Harbour for a 48 mile tour of the Romney Marsh. This area is a cycling paradise as the terrain is virtually flat and the country lanes are extremely quiet. Lunch was at Biggles Restaurant in Lydd Airport and afternoon tea at Miss Mollett’s High Class Tea Room in Appledore. It was certainly high class: bone china crockery and pots of leaf tea; no tea bags here and, yes, we were provided with tea strainers; remember those? Friday was another rest day but on Saturday morning, some of us cycled to Molly’s Café on the promenade at Rottingdean for morning coffee; no bone china here but the Americano was superb. This was a round trip of 20 miles which raised the total distance for the week to 250 miles. It was a great week of cycling and all of us now feel a bit fitter and ready for those long distance cycle tours. Today, the 28th February is the last day of Winter; that’s the Meteorological Winter of course. There’s no point in pretending that Winter still has three weeks to run, ie to the Equinox, as it was clear on our touring ride today that Spring has arrived judging by all the daffodils blooming in hedgerows and gardens. It was a beautiful morning as seven of us cycled towards Hailsham to join the Cuckoo Trail and then head southwards to the Old Loom Mill at Summerhill for a refreshment stop. It was virtually wall to wall sunshine, there was just a slight breeze and the air felt warmer than in recent weeks; ideal cycling weather for this time of year. It certainly felt like a springlike morning! It’s been quite a good Winter for the tourers. A few rides have been cancelled due to inclement weather but, since 1st December, 23 touring rides have taken place which is possibly the best Winter season the tourers have had. 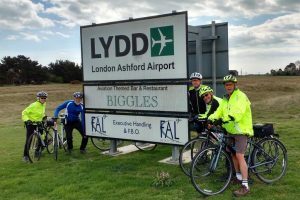 Hopefully, the number of touring rides during Spring will much greater, starting with a ride to Shoreham Airport on Thursday, 2nd March. Over the next three months there will be rides to all the café stops on our Refreshment List plus a few new ones like Old Loom Mill today. It was third time lucky for a touring ride to Muddles Green today (Tuesday); two previous attempts this year had been cancelled due to bad weather. 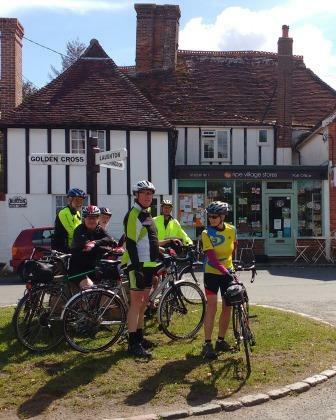 However, the weather today was fine and eight tourers cycled to Muddles Green for a refreshment stop at one of our favourite cafes, the Chiddingly Village Shop & Cafe. It’s a community shop located in what used to be a farmyard at Farley Farm. Hopefully, the cold weather of Winter is over and we can look forward to more fine days; after all, Spring is just around the corner! We try to have three touring rides each week: Tuesday, Thursday and Sunday. The Tuesday rides are the shortest at approximately 25 miles. Those on Thursdays are the longest and are usually more than 40 miles; sometimes as much as 70. The Sunday rides tend to be between 30 and 40 miles. Our rides are called touring rides as we cycle at an average cycling pace of about 12½ mph, the sort of pace that most cyclists would adopt on a long distance cycle tour. Also, all our rides include a refreshment stop. Other rides being planned later this month are to Blackboys, Horam, Rottingdean and Bexhill and possibly Isfield. So, if you’re an experienced cyclist and fancy a bit of ‘touring’ then please give our rides a try. Details are on the Rides Calendar.